Today, the initial challenge was to create story boards that summarized the model development so far in each unit. The boards were to summarize the model with diagrams, pictures, graphs, but no word explanations. Essentially, a summary in pictures. We did this for units 4-7. Each group took a unit and summarized in on a board and then we presented them to the class to make sure we had a sense of the model development sequence. Kind of like a, "view from 20,000ft.," the model summary boards keep you grounded in the big picture of what's going on in the curriculum. Since we didn't have an article to discuss today, our summary boards led us into a discussion that was philosophical in nature anyway. We discussed whiteboarding in our classrooms and how, if the students bought in to whiteboarding as we have in the workshop, students would be very self-directed in their whiteboarding practice in class. Whiteboards can even be a sub-plan after a class becomes facile with the technique. Students regularly have to whiteboard their homework and present to each other when the teacher is there, why stop this practice if there is a substitute teacher? It was suggested that you could simply leave an answer key to the homework with the sub for students' reference. A student could get to play the role of the teacher (class might vote to decide who will impersonate the teacher) and have them take photos of their boards and send to you (on email, twitter, or Google+) just for record. At some point during the year, students will take a more active role in questioning during whiteboard sessions, and they will be able to run a whiteboarding session to go over homework on their own without much, if any, prompting. This is an ultimate goal, to empower the students to be metacognitive enough that they can self-analyze and regulate their own examination of homework solutions and problem-solving strategies. Based on the data, they should be pointed to consider which reactant to base their calculations of predicted amount of product on. Though they might choose either reactant, which amount can they be certain of in their calculations? Do they know that their mass of copper is all the copper that reacted? How about the silver? The reactant to product ratios, which they saw in previous labs can help determine how much reactant was used up and which reaction took place, can help to resolve this issue. They will inevitably see that silver nitrate was mostly (if not completely) used up in the reaction because the mole ratio of silver nitrate to silver they measured is about 1:1; and according to either possible balanced equation for the reaction, the silver nitrate to silver ratio should be 1:1. That means a close to 1:1 ratio of silver nitrate to silver in the lab implies their amount has a good degree of certainty for basing calculations upon. Going forward, they can base their calculations on the silver nitrate used in the reaction to predict how much copper would have been used in the reaction and then compare that to the amount of copper used they actually measured. When they see this comes out fairly close, they can then use the copper to silver ratio to determine which reaction took place. Just like the discussion section of a traditional lab report, the post-lab discussion and debrief for this experiment is very meaty and should not be taken lightly. It is the chance to introduce the terminology limiting reactant, excess reactant, and percent yield in the context of the lab and their empirical data. Once they have a sense for the terms, and they've arrived at which reaction took place, they can calculate a percent yield for their experiment and discuss uncertainties in the lab. Once the lab objective has been achieved, students should conclude that it doesn't matter how much you use of the reactants, it will still proceed according to the balanced equation. This is the anchoring principle that they should have going forward into stoichiometry. 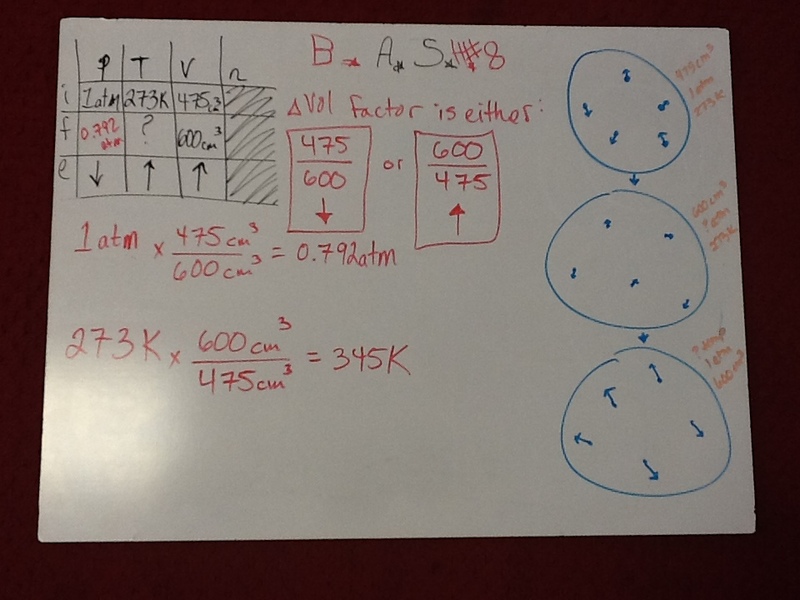 Once we finished our lab debrief, we practiced whiteboard questioning with BCA table method of solving stoichiometry problems. Many of us have really gotten the hang of questioning and whiteboard sessions after 12 days, and so we were ready today for some advanced techniques. We practiced questioning correctly done boards and differentiating between silly mistakes (e.e., accidentally omitting a 2 subscript on hydrogen gas to make it diatomic in an equation when the student knows better) compared to errors of major conceptual understanding. We agreed that not all whiteboards are created equal, nor do they all have errors or the same type of errors. Thus, we need to be prepared for all the possibilities. We also discussed including other students in the questioning process, even going to the length that the teacher can whiteboard a problem solution and present it to the class and students can question them. The most advanced technique anyone had ever tried was to play the Mistake Game (explained in detail by the amazing Kelly O'Shea) where students purposefully (or accidentally even) embed mistakes into their whiteboard solutions and other students have to try and elucidate their error during presentation through questioning and discussion. Several other advanced techniques for whiteboards in the classroom were discussed and considered, including some from a "whiteboard ninja" named Bowman Dickson. Definitely one of the most cerebral days in the workshop thus far. With unit summary boards, the introduction of stoichiometry, the BCA Table method, a limiting reactant lab done through inquiry, and advanced whiteboarding techniques, this was a modeling pentathlon for sure, but it was empowering and insightful nonetheless. Stoichiometry is one of the most nettlesome content topics to teach students and often becomes the make-it-or-break-it moment in many students' introductory chemistry experiences. 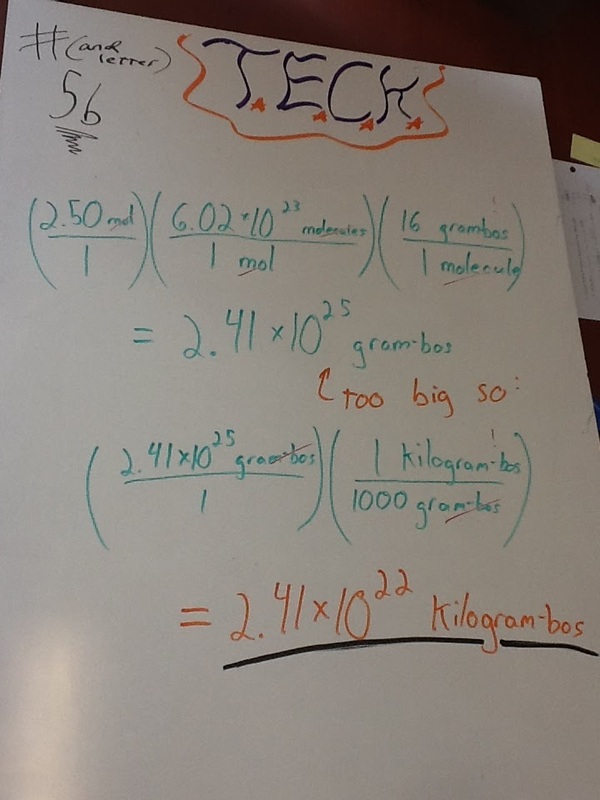 Having a better way to teach stoichiometry is greatly encouraging! Two days left to go; home stretch, here we come!! A major endeavor of the modeling methodology of science instruction is to address and correct student misconceptions about science ideas. On day 8, we read an extensive article by Vanessa Barker about the variety of misconceptions that students have about chemistry. 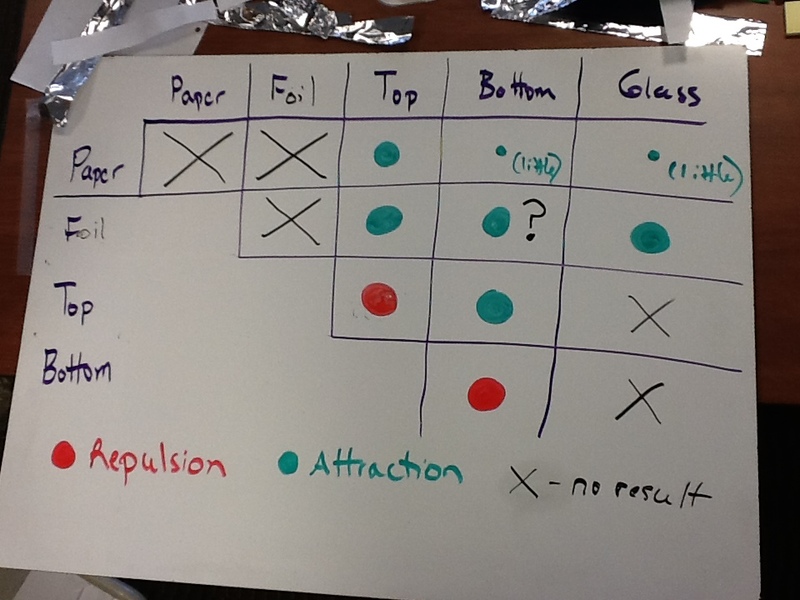 We continued today in the direction of misconceptions but narrowing our focus to students' ideas about energy. William Galley's article "Exothermic Bond Breaking" chronicles persistent misconceptions of energetics by students in a variety of science classroom settings. Galley points to misrepresentation by science textbooks and ineffective instructional practices as being sources of the disinformation that "energy is released when chemical bonds are broken." This leads to what we fondly called the 'Pixie Stick Model' of energy, which many students are led to hold based on instruction in high school biology (and sometimes chemistry) courses. This misconceived understanding of energy views chemical bonds, such as those in the "high-energy phosphate bonds of ATP," like Pixie Sticks. 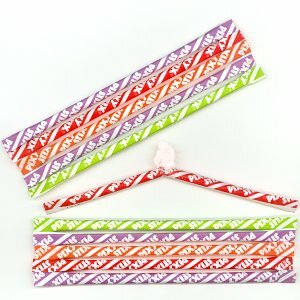 When the Pixie Stick bond is "broken," the energy is "released" like the crystals inside of the Pixie Stick. It is misleading to students that bonds are talked about as physical objects that can "contain" energy, when it actually is the case that the bond is not a physical object but rather an interaction between electric fields, where the energy is really stored. We noted from the article that traditional language used to describe chemical bonds, especially the language associated with energy molecules in biology courses, can be attributed to this inaccurate view. We all agreed that we cannot use language that makes it seem like bonds "store energy" or that "energy is liberated upon cleaving the high-energy bonds of ATP" in biology courses, but also that we need to be cognizant of these preconceptions when students enter high school chemistry courses. Instead, we must do a better instructional job of helping students to realize that it takes energy to break bonds and can release energy when bonds are created. In the end, there really needs to be a comprehensive model that takes into account both bond making, bond breaking, and the net energy transfer after a chemical reaction is completed. Focusing on energy transfer in chemical reactions proves, according to Galley's article and the Modeling Instruction research, far more useful in communicating a coherent view of energy. 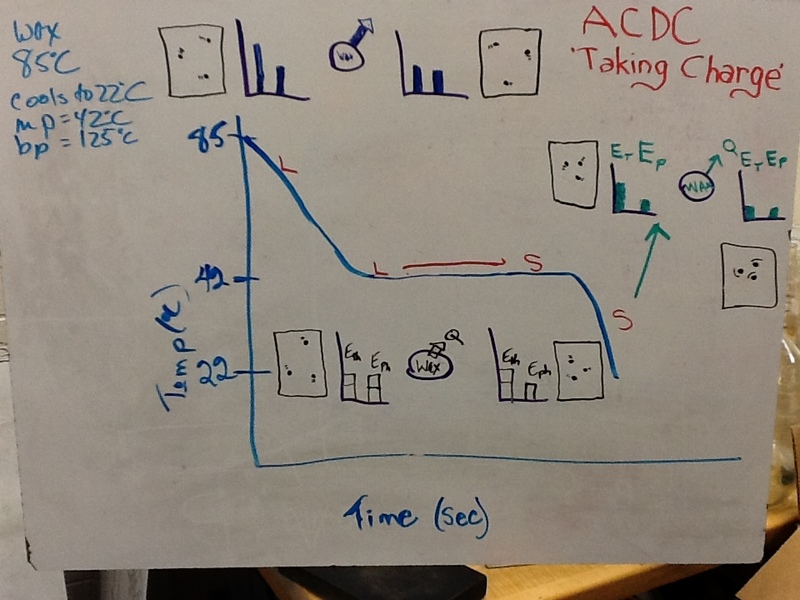 Galley also promotes schematic diagrams to represent the energy transfer in systems, which he describes happens more frequently in college-level chemistry courses. Other recommendations from Galley include, teaching the difference in bond energy between substances more explicitly, as well as better communicating that the bond energy refers to energy required to break a bond. These changes can make clear that it takes energy to break bonds and releases energy to make bonds; therefore, it's the net energy that really determines the exothermic vs. endothermic descriptor of a chemical reaction. 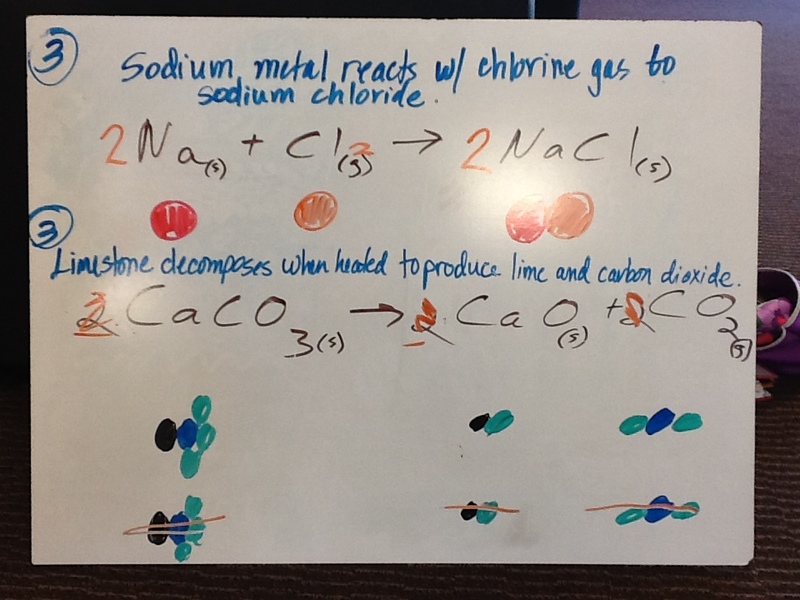 Following the conclusion of our article discussion, we practiced whiteboard questioning with balancing chemical equations and representing the balanced reactions with particle diagrams. There are several strategies out there to balance chemical equations, but often it is taught in a way that makes it seem like there are procedural rules that can be algorithmically followed--that isn't always the case. What is the case is that some methods of balancing chemical equations, especially those that do not include particle diagrams, can lead students away from having a concrete conception of what is physically happening in a reaction. All balancing strategies taught in modeling chemistry are accompanied by a particle diagram. This provides a visual basis for self-assessing the correctness of the balanced chemical equation. Since the modeling method stresses the importance of having a particle view of matter, the diagrams become imperative in balancing reactions. This also keeps students grounded in the model of chemical change that is 'rearrangement of atoms' and thus conservation of matter. Our questioning has improved, but one thing that we all noticed in each other was how much we gravitated toward positive feedback in playing the role of teacher questioning students. We all have been encouraged to maintain a good level of praise in the classroom, but it was noted that the object of the praise became unclear to students in some situations and could lead to a false sense of confidence in one's problem-solving strategy. In our debrief, this led to the question of praise in the classroom (2012) and its role in whiteboard questioning sessions. How/when to praise? An interesting technique called, "Right is Right," was brought up from Doug Lemov's Teach Like a Champion book. According to this technique, it is important to hold content/strategy praise until a right answer is presented. Attempting to praise an attempt or effort when a response is inaccurate can mislead students into believing their thinking is sound. The praise discussion poured over into a discussion of the classroom climate that would encourage risk-taking and a sense of security. We kept coming back to a notion we arrived at earlier in the course, 'modeling doesn't work if you don't build relationships.' This mantra is essential in making a successful modeling classroom and modeling instruction experience for students. There are many different strategies for building rapport in ones classroom, but everyone must do something that fits their personality and teaching style. Instruction must be personalized and the human element cannot be omitted if you want your class to be a success. Next up was a set of reaction lab stations, where students have the chance to observe many different types of reactions and determine the physical signs that a chemical reaction has taken place. By comparing and contrasting the different reaction types they observe, the lab stations can elucidate patterns in chemical reactions to students and give rise to a predictive model for determining products. 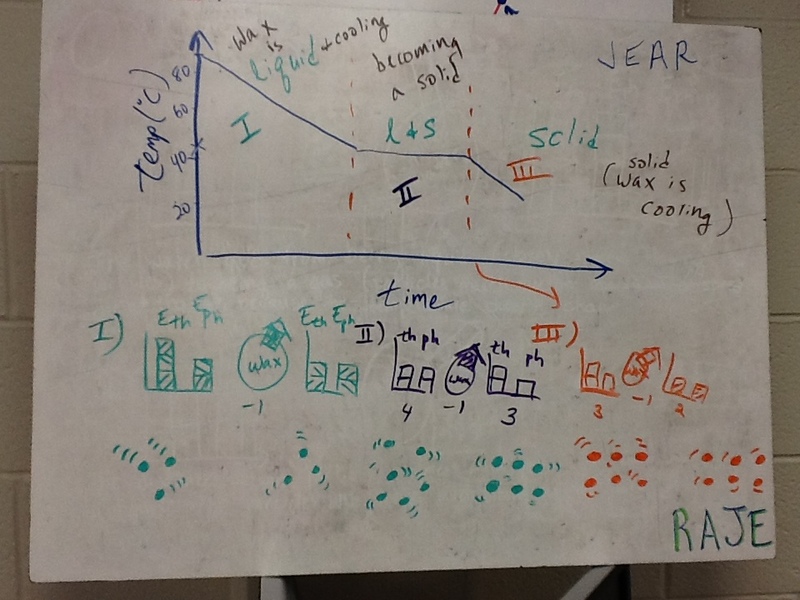 This takes students into classifying and modeling with equations the different types of reactions. I recalled how I used to teach reaction types, as I was shown to do in my student teaching, which was to model the reaction equation templates as relationships between people. For example, my mentor teacher suggested that a double replacement reaction was just like the TV show Wife Swap. Instead of writing out AB + CD --> AD + BC, I used to draw out stick figure couples of husbands and wives, then show the swapped couples! Though it was laughable and memorable, it didn't really make clear anything chemical about the reactions for most students. When I discussed this former approach with my fellow workshop participants, we decided that was poor practice because it personified chemistry. Be careful with 'personifying elements' to students; though it might be memorable in a story-like way, it can tend to oversimplify, or even mislead students about, the concepts. Finally on the day, we took our balanced equations and looked for a way to represent energy in reactions. Based on our Galley article reading, and inspired by our previous treatment of energy from day 6, we chose to follow our established conventions in the LOL diagrams to represent chemical energy transfer. 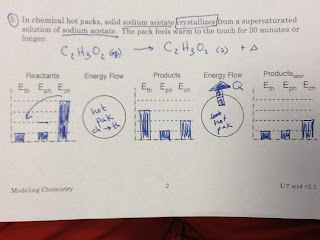 We brainstormed how we could characterize the difference between exothermic and endothermic reactions in sequence with our modeling curriculum, and we concluded that we could introduce endothermic v. exothermic v. activation energy based on energy transfers and overall net energy transfer during reactions. Chemical reactions trasnfer energy "internally" within the system, but can ultimately translate to a transfer of energy into/out of the system through heating. We agreed to describe endothermic reactions as products require more energy than reactants to maintain their particle arrangement and exothermic reactions as products require less energy than reactants to maintain their particle arrangement. This allows students to fit the terminology into their model of energy transfer. With this approach, it is important to focus on keeping separate the internal energy transfer between energy "accounts," how the system is defined, and how energy can be transferred into or out of the system from/to the surroundings. Depending on your course curriculum, we found this to be an appropriate place to introduce spontaneity in reactions and discuss when energy transfer occurs. During spontaneous processes, the energy transfer with the surroundings occurs after the reaction; however, during non-spontaneous processes, the energy transfer with the surroundings occurs before the reaction in order to make it happen. Including activation energy can be done here, but it should be incorporated in a manner consistent with the LOL diagrams model of energy transfer; otherwise, it can be held off until a study of reaction kinetics. Throughout the 40-page article, Swackhamer details many aspects of energy in various contexts and how to think about energy for understanding. Ultimately, we were all able to identify with the need to better teach energy concepts to students so that they have a conceptual model to apply in a variety of energy contexts. 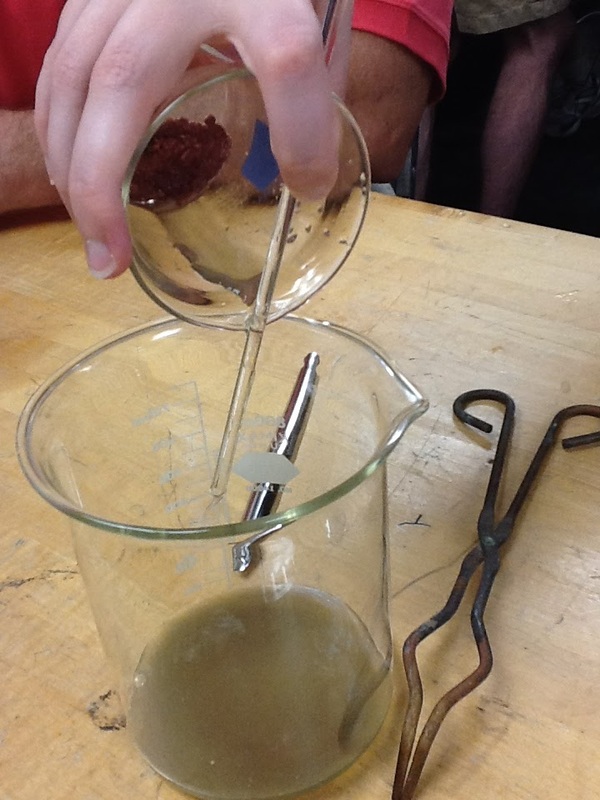 Our paradigm lab in this unit is the Iron Nail in a solution of copper (ii) chloride. I wonder what will happen when this dark grey nail is submerged in this blue solution for a while??? We started by massing out the copper and iron before combining everything with water into a beaker. Then we combined everything in the beaker and made some observations. The beaker was left alone for a while and then the next day we removed the nail. 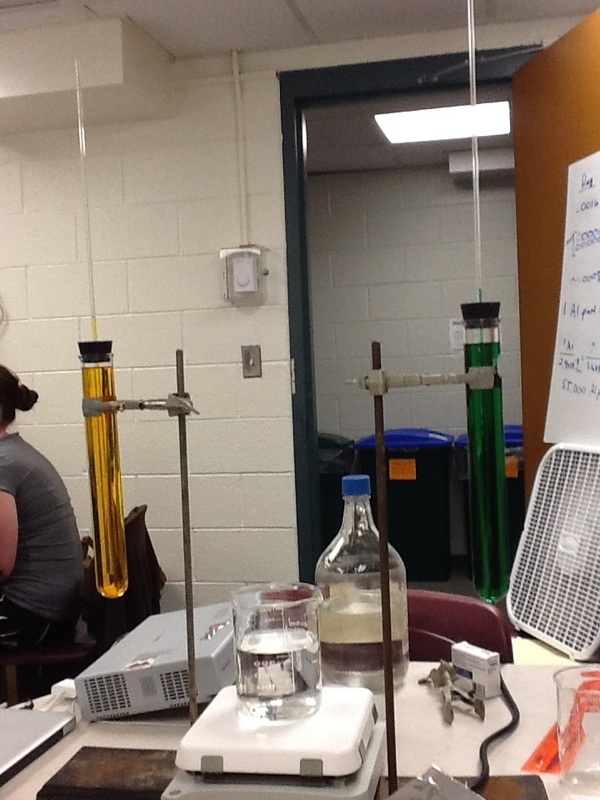 Over time, the color of the solution and contents of the beaker changed. Once we removed the nails, we isolated all the "orange solid" that was in the beaker and had gathered on the nail. We washed this solid with water and acid, and then we put it on a hot plate to dry for a while. After all was said and done, we massed the nails again and the orange solid that had formed. The comparison was very interesting! Upon speculation of what the orange solid could be, we reasoned that it was most likely solid copper metal. This led us to infer that copper and iron had switched places in the beaker, thus producing new substances that weren't there before. Specifically, based on our previously devised model of charged particles and ions, we decided that copper ions had become atoms on the surface of the nail where iron atoms had become ions and went into solution. After we whiteboarded our particle diagrams of this change, we concluded that the switching of places and changing of substances in the beaker amounted to what we wanted to call a "reaction," which is a term not previously used in our sequence. 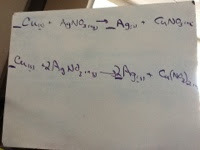 We defined a reaction as: a rearrangement of particles to form different substances. The debriefing that led us to this reaction, the way to represent it with an equation, and a definition for chemical reaction took a fair amount of time, especially because we had a lengthy debate about the way to represent the ions in solution using our particle diagrams. Eventually, we arrived at consensus about what took place and how to represent it. Then, our day finished up with crafting whiteboards where we deployed our model of chemical reaction to represent the substances involved in a variety of reactions using particle diagrams. This would set us up for our next participant-led questioning session that will take place on day 12. After we finished with our thought-provoking whiteboarding session and article discussion, which you can read about in detail here, we continued through the historical development of the atomic model to the existence of a subatomic particle that has negative charge. This was accomplished using explorations into the work of Faraday, Crooks and Thomson. We conducted (heheh..."conducted") the sticky tape lab where we tested the attraction and repulsion of Scotch tape strips to different materials, which led us to arrive at a need for particles smaller than an atom; moreover, the conclusion that a negatively charged particle (later called an electron) must exist inside of the atom! 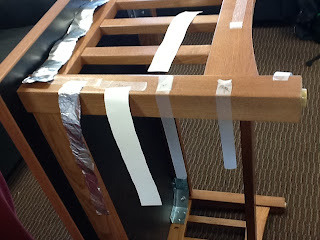 The "Sticky Tape Lab" (which can be found in its full modeling entirety on the AMTA website) is a rework of a classic physics electrostatics lab. 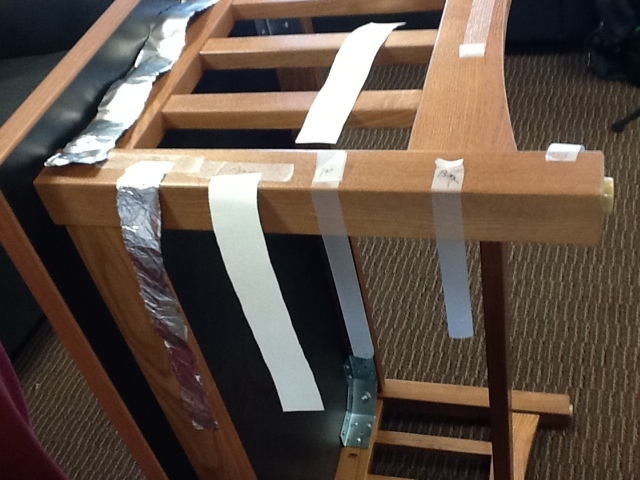 This lab provided students an opportunity to test the behavior of strips of tape, which had been ripped apart from each other, when in brought in proximity to aluminum, paper, glass, and other ripped apart strips of tape. Based on our results, we determined the charge of each piece of the tape and thus the charge on the other materials as well. Following a very informative video about cathode rays and the experiments surrounding them, the model development to arrive at the existence of charged subatomic particles was complex but happened--this will take carefully crafted planning to do with students, but was really impressive because of how it followed a similar development of the charge model in physics. Our model developed to accommodate the transfer and flow of charged particles, as well as help us to characterize our newly "discovered" charged particle. We were able to represent charged particles inside of the atom in a primitive way along with introduce a new property: conductivity! As it turns out, the model we arrived at was that of J.J. Thomson's "plum pudding," but it explained all that we had seen quite well. In context with what we have been doing all year, it makes sense to arrive at this model of the atom at this time; however, there was copious discontent with even exploring this model much more than out of honorable mention considering what we currently know about atomic theory. It's important to note here that the atomic models developed throughout history are NOT merely artifacts but rather evidence-based and well-reasoned attempts to explain the science behind matter and its interactions. All too often, the "history of the atom" chapter is glossed over in chemistry classes by students, because it has the word "history" in it, and by teachers who rush through it to get to the "true (current) stuff" about the atom. I have to admit that I used to be one of those teachers; however, I was never given a full understanding of the development of the atomic model and now I have a MUCH greater appreciation for it and see how important it is in understanding chemistry. Though it may seem unnatural to follow chemistry through a chronological progression of atomic model development, we cannot reduce the model development to mere prestidigitation and page turning in a textbook. This methodology doesn't just honor the "history of the atom," it simulates the models of the atom historically and in context with the associated chemistry that was known at all the points along the way. Resist the urge at this point in the curriculum to jump to a "full-blown" model of the atom that uses all the common jargon, even if it is true that students "already know" that atoms have these subatomic particles. Stick with plum pudding and let the rest come in time. As a final aside, I always wondered who ever liked plum pudding anyway, I never remember Bill Cosby advertising it! Then again, I shouldn't knock it before I try it. Perhaps we'll just have to make some plum pudding this year in chemistry and taste it for ourselves! That'd be memorable, right?! We got right to work today finishing our first participant-led questioning session with whiteboard presentations of review problems in unit 5. Everyone was given as much time as they needed to work on questioning with their "students," but it did go more quickly by the end than it started. Embedding plausible student mistakes can be difficult for teachers to really simulate students' incorrect lines of thinking; and, as a result of our natural tendency to forget what it was like to not have a solid understanding of the content, this challenge extends into trying to understand, diagnose, and remediate students' misunderstandings. At the end, we all debriefed the whiteboarding session and our questioning attempts--we determined that we all need more practice. A hard lesson learned was the difference between closed and open questions in this session; that is, questions that will only elicit one response (e.g., yes/no) rather than questions that can have a variety of responses communicated in a variety of ways. Immediately following the whiteboarding session, we discussed two articles on whiteboarding as a learning process and Socratic dialogue in teaching. The article review coupled with our own experience as "students" in the workshop led us to many great points and even more great questions. Whiteboarding truly is an essential component of modeling instruction, and it is a learning process. It is not just an activity or another way to go over homework; rather, it is a way to make thinking visible, help students become more metacognitive and to reflect more on their own understanding. Of course, you don't have to use modeling instruction to do whiteboarding, but you do have to use whiteboarding if you do modeling instruction...regardless, you can employ strategies that make thinking visible, such as those given by Harvard's program on the strategy. This discussion included ways to hold students accountable for their work; e.g., students who construct the whiteboard cannot present, or everyone must speak during the presentation. This helps to get everyone an equal chance to be involved in the process, rather than leaving up to be dominated by certain individuals who may be more "in the know" than others. A great idea that came up was to empower students to ask the teacher-style questions of each other, and not just during whiteboard presentations but in all aspects of the class. Having them emulate the teacher questioning will prevent them from being mere "tellers" when helping others or working with each other. Also, we know that to fully understand something would entail that one comprehends the connections between aspects of a concept and has an ability to navigate through multiple representations of the concept or anticipate pathways that can lead to understanding of the concept. After all, if someone can teach someone else something, without merely "explaining" it to (telling) them, then mustn't they have a strong understanding in the first place? Asking good questions is different than telling in an interrogative way. Don't just end your questions with "...right?" or "...yes?" because it encourages an affirmative answer so that the student appears 'in agreement' with the teacher, since the teacher is viewed as the expert...right? Whiteboarding sessions should be used as an opportunity for students to learn from mistakes and not merely just arrive at an answer. All too often, it is just about the right answer in school, and when students come to expect that, they can lose sight on the learning process and the underlying comprehension that underpins the right answer. This can be significantly helped if the teacher resists the urge to correct mistakes that students make on their whiteboards before presenting them when they are constructing their board; instead, let the mistake get presented and then fix it as a class through discourse. Never let a mistake proceed uncorrected during a whiteboarding session. Coupled in with our discussion of whiteboarding and Socratic discourse, stemmed from our practice at questioning students during our simulated whiteboarding session, was a discussion of the student errors we saw in the session. Issues with dimensional analysis, especially multiple steps, and misuse of the relationships between quantities, were our main areas of focus. We agreed that, because students sometimes just focus on just matching units up in an algorithmic fashion under the factor-label method, stoichiometry becomes a separated based on mathematical ability and cognitive development to formal operational thinking. Students seem to have a struggle with stoichiometry and dimensional anlysis or are quite facile with it. The challenge, however, lies in the approach to teaching these topics. If dimensional analysis is reduced to a factor-label chart with the answer as the main focus, then students will lose sight of the physical relationships between quantities and not necessarily know what it is that their answer means, let alone how they arrived at it. Using single step proportions (or even the cross-multiply setup that students learn in math) can allow students to keep the physical context at the focus of their problem-solving and attend to the physical relationships between quantities to help them reason their way or think their way to a solution rather than perform a mere algorithm. This can be accomplished using "for every" speak, which is a linguistic representation of the physical relationships between the quantities. 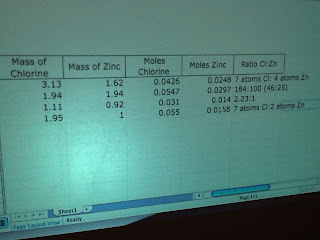 Using "for every" statements in your teaching of dimensional analysis or stoichiometry is discussed in more detail here from a presentation given at ChemEd 2011. This is not to say that the factor-label method cannot ever be used, rather it is expedient and a helpful way to solve the problems, but it is not intuitive nor a form of reasoning; it is an algorithm that can be applied without an understanding of what it means. Since we want students to be critical thinkers and to be able to reason their way through a problem solution, starting out with an algorithm (shortcut) will mean nothing without a full development of the concept behind it. The "for every" statements can eventually lead students to arrive at the factor-label algorithm on their own, or at least to apprehend it more easily when it is taught. Ultimately, we want our students to be empowered and to feel success with their chemistry, but this cannot be accomplished if we teach only in a way that makes sense to someone who has a higher-level understanding of chemistry to begin with; keep in mind that many of our students are still concrete thinkers and will not develop further just by being forced to think in a formal operational way; instead, we need to scaffold them with intuitive approaches that will transfer to reliable problem-solving strategies later. This is done with the way we teach, how we make thinking visible, and how we engage students with us and each other in Socratic discourse of a nature that is critical to the content we are trying to teach & learn. One of the hallmarks of reform in science education deals with finding pedagogical approaches that can correct misconceptions in students' understanding of scientific ideas. Much of the work in the modeling instruction program attempts to confront students' naive views of the physical world and motivate them to adopt a correct conceptual framework for scientific ideas. Today's article discussion centered around an extensive inquiry by Vanessa Barker into students' misconceptions of chemical concepts. Barker's manuscript reviews the literature on misconceptions in chemistry as well as generates ideas from student interviews. Her concluding reflections on best practice with regard to correcting and avoiding misconceptions in chemistry education indicate several areas where instruction should focus conceptual understanding. According to Barker, teaching using multiple modes of thinking about chemical ideas, including symbolic, diagrammatic, and quantitative representations, can lead to a more solid understanding. For example, when performing stoichiometric calculations, it could be helpful for students to draw particle diagrams that represent the balanced equation before attempting to solve quantitative calculations. This can help them to keep their problem-solving attached to what is physically happening in the reaction and understand better what is taking place. With regard to concepts that could otherwise be quite nebulous to introductory students, such as energy and entropy, having a visual representation can help students bridge the gap between concrete and abstract thinking. All in all, everyone agreed that despite their best traditional approaches to instructional delivery in these areas, a fair number of students still came away from lessons with misunderstandings. This helped all of us to agree that a different approach is necessary--that's why we're taking this course in modeling instruction, right!? After our poignant discussion of misconceptions in stoichiometry, it was on to developing a concept of the mole based on experimental evidence and following the same discovery sequence that historically took place in chemistry. We learned to "count by massing" with an activity that applied Avogadro's hypothesis to prescription bottles full of different types of hardware. 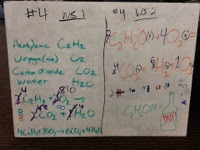 In doing so, we developed a mass to quantity relationship and learned that it was different for different substances. 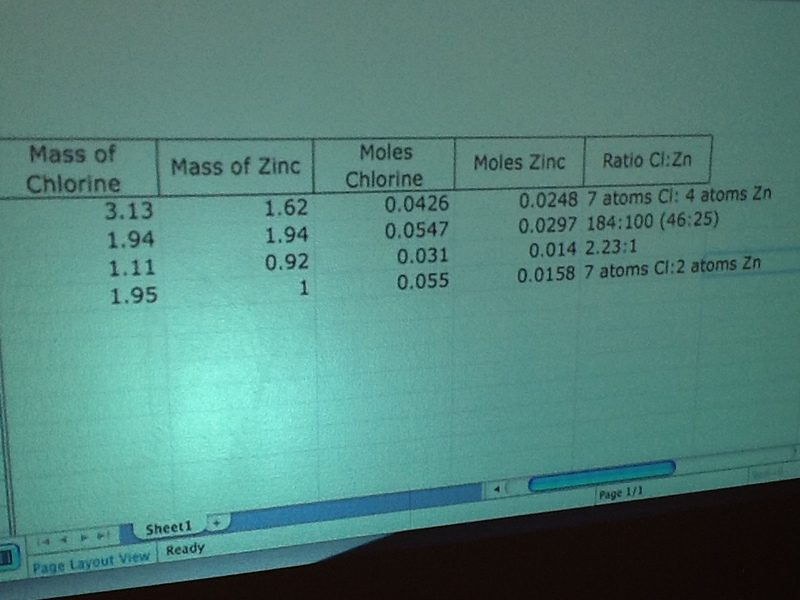 We were also able to find mass ratios, and relative masses, for the hardware. We then moved on to apply this new found understanding to conduct an empirical formula lab with zinc chloride. These endeavors led us later to abstract the relative mass of individual particles and eventually the relative masses of the elements. It was actually really fascinating to see that relative atomic mass could be arrived at empirically like this. A standard element is used as the comparison and all the other elements' masses are determined relative to the standard--this made the atomic masses of the elements far more meaningful from both a student perspective and personally from a teacher point of view as well. I actually cannot recall ever making the connection of atomic masses to relative atomic masses with my chemistry students in the past, but that is an important point that they need to understand, because had any other standard been used, the atomic masses of the elements would be different, though their relative masses would stay proportional to one another. 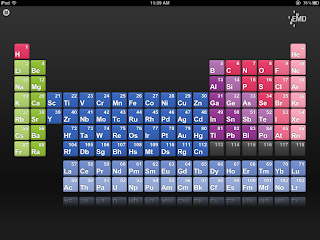 This screenshot is from a periodic table iPad app by EMD Chemicals, called EMD PTE (free,) which displays the elements' relative atomic masses. 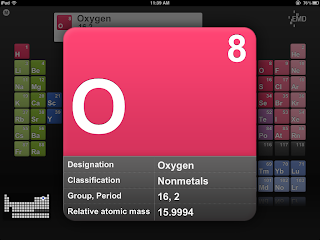 This app is simple and has a nice interface, but most coincidentally, I appreciate much more now that it displays the relative atomic mass and not simply "atomic mass." *There are other free periodic table iPad apps, which are also very good, including one by NOVA. The empirical formula lab is often done in chemistry classes of various levels as a verification lab (a lab done simply to verify a conclusion that has already been communicated to students) as opposed to an inquiry-based lab (one where the students empirically arrive at the conclusion that would otherwise be directly communicated.) 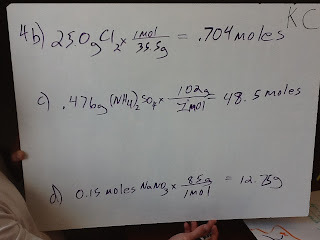 However, in this sequence, the mass and particle ratios, including relative atomic mass, and empirical formula determination are all done before teaching nomenclature and complete formula writing. Typically, nomenclature and formula writing are usually taught using a model of bonding that is based on electric charge; historically however, derivation of empirical formulas was possible before a solid understanding of charge and bonding based on charges was part of the communal knowledge. The modeling sequence gives students a more concrete foundation for the physical ratios of particles in compounds and in the fully uncovered formula writing that will follow later in the curriculum. 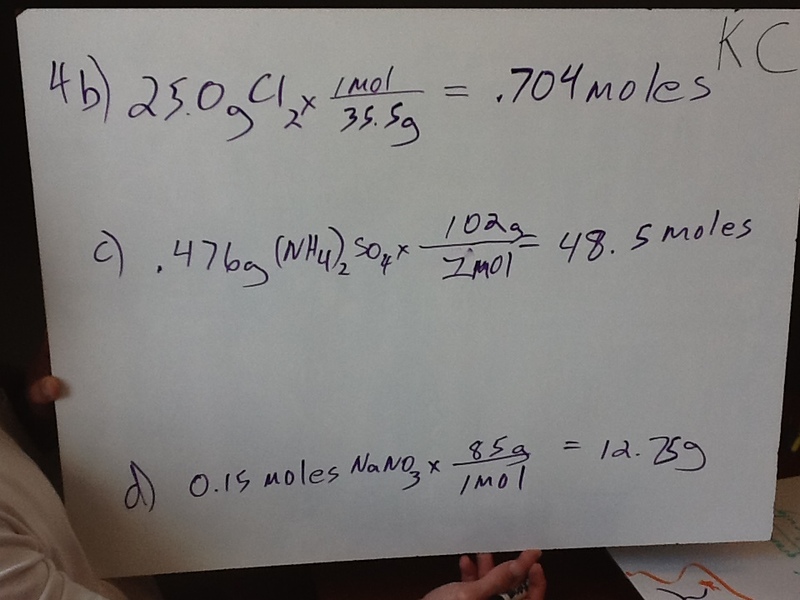 The rest of the day focused on stoichiometric "conversions" between mass, moles, and number of particles. This was an area that the article, which we earlier discussed, had noted is part of a stoichiometric pitfall of understanding for students. I put conversions in quotations here, because the ones we do in stoichiometry are not really true conversions, because they "convert" between units of different quantities and not units of the same quantity, e.g., converting from feet to meters is a length-length conversion since they are both units of length, but converting from meters to pounds (length-weight) would not be a true conversion since they measure different quantities. We considered different approaches to working out these "conversions," but most teachers fell back on the factor-label method. 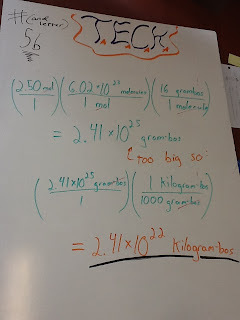 As a group, we were tasked with embedding student mistakes into our whiteboards of the stoichiometry problems, and then to practice teacher questioning with each other when we led the whiteboard session; however, it was a struggle for us to generate naive mistakes in our problem-solving and truly think like students. As chemistry teachers, we have had lots of practice with calculations and become very facile with them. Most of us can think problems through using a factor-label approach, but that is because we are at formal operations stage of thinking and development, cognitively speaking. Our "strug-fest" with generating student errors was a consequence of being unable to really empathize with a student who could not understand the factor-label algorithm. Some of us, literally, could not fathom how a person wouldn't understand what is often called, "dimensional analysis." We come to fall victim to our own retrograde amnesia, where we cannot remember what it was like to not understand how to do dimensional analysis using factor-label method. Factor-label seems easy enough, but often doesn't require any true understanding of what the situation entails if you can match up the labels with the factors properly to solve for the desired unit. Are they mere conversions that can be done using a simple proportion? Are there inherent considerations with the factor-label method that raise issues for some students? Is it oversimplifying to reduce these conversions to cross-multiplying with proportions? Is it possible to do multi-step problems in several individual steps, or do they have to be done in one combined step? These are all very valid questions about how to teach these conversions, and they will later be applicable questions when we get to stoichiometry that relates to determining product mass, for example, based on given initial conditions, or the like of which students often flounder or flourish. Could we somehow make the process of stoichiometry more concrete for students at first, then allowing those who can "do the math" more easily take off on their own factor-label adventure? I propose that "for every" statements are a concrete solution to making stoichiometry more accessible to students, because it makes the proportional reasoning more intuitive and keeps them ground in the physical situation. Then, every aspect is done as multiple individual steps, but can be transitioned into combined one-step solutions that encompass factor-label algorithms once they understand what it is that they are actually doing. After all, aren't we in this to help students to succeed and not just allow the ones, who would otherwise do so anyway, to proceed? Here, I describe a more cognitive approach to stoichiometry "conversions," which can be a lead-up to using factor-label method and can benefit all students, especially those who have difficulty with proportional reasoning, it deals with using "for every" statements to work with stoichiometry. After two weeks of the modeling chemistry workshop, we finally arrived at a point today where the periodic table was introduced. Based on our sequence and model development, this point in unit 6 is the first time where classifying substances based on their properties and arranging them has full relevance to uncover a need for the periodic table. Yesterday, we introduced the property of conductivity of elements, but today we did the same with compounds and solutions. We found out that ionic compounds need to be dissolved in solution before they will conduct charge. This can be accomplished in the lab (kind of like this one) with solutions (salt, sugar, water, Gatorade, etc.) and probes or virtually using a PhET simulation. We compared the properties of atomic, molecular, and ionic solids in terms of the structural unit of each and connectedness between discrete units. This can be done using x-ray crystallography structural visualization software (freeware) called Mercury. The software allows you to look at a 3D model for the structure of different solids. As a class, or in groups, the students can complete the structure classification activity. Based on our observations and classifications of each, a formal definition for atom, molecule, and formula unit were developed. This led to a need for a way to communicate the properties of a compound and distinguish it through nomenclature from other compound types with different properties. Thus, naming and formula writing were introduced, along with chemical symbols, dealing with molecular compounds and ionic compounds, including polyatomic ions in some of the compounds as well. In contrast to what most of the teachers in the workshop described, this is much later in a typical curriculum year that these topics are introduced. 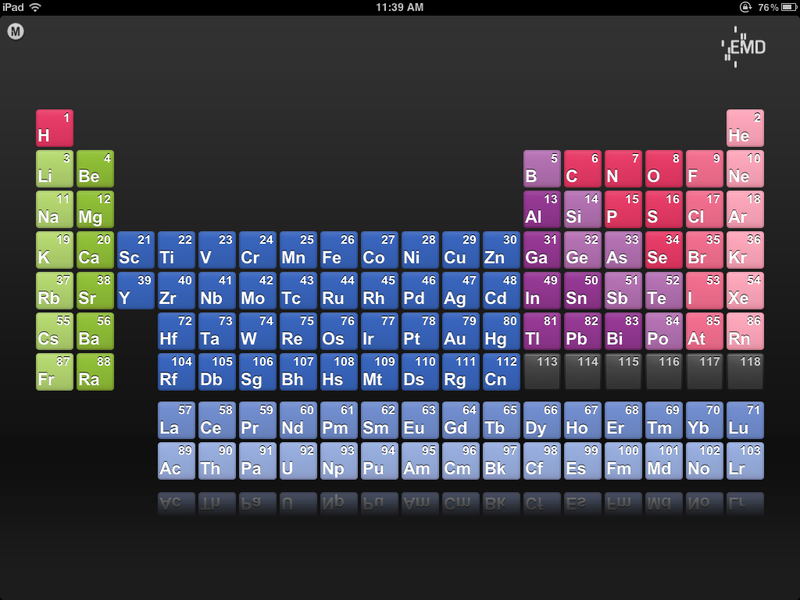 Many traditional sequences start the year off with symbolism and nomenclature, not to mention the periodic table. However, introducing the periodic table at this point in the model development allowed us to develop a model for ionic bonding that was not based on the good old drop and swap method algorithm. In the case of uncovering a model for ionic compounds, we relied on our knowledge of empirical formulas and definite proportions to determine the charges on various ions and piece together a way of understanding how they went together with other ions. It was very tempting to go into detail about electrons in the different ions or to elaborate on the bonding mechanisms, but that is not for this unit--that all comes later. For this unit, students merely arrive at a basic model for ionic bonding and covalent bonding; they keep to examples that fit the model at this point and later on will encounter instances where the model may need to be revised, e.g., transition elements in compounds or how polyatomic ions are formed. Interestingly enough, there is not a delineated approach to teaching nomenclature in the modeling methodology, because nomenclature literally follows mere conventional rules. We discussed some different ways to make the teaching of nomenclature more accessible to students, including 'chunking' the different types of compounds that can be named, or choosing the order in which you teach molecular vs. ionic compound nomenclature to best fit your students. In the end, it turned out that this was one of the only things that is left up to the teacher's discretion for how they teach it in the modeling curriculum. The connection to the chemistry modeling curriculum is that the students will have arrived at a need for chemical nomenclature to readily communicate the type of compound and its properties before you teach nomenclature; this makes it at least more contextual than a mere set of rules of the chemical language. We know as teachers using the modeling instruction methodology that even the most seemingly direct instruction can be improved by making it into a discussion with whiteboarding and interaction, not mere lecture. So, regardless of how you choose to teach nomenclature, make your slant on it fit with your modeling instruction pedagogy as best as possible. Our discussion wrapped up with brainstorming some ideas for teaching nomenclature in a non-direct instructional way, including POGIL activities and ChemQuests to give students a chance to think about the rules of nomenclature in a more critical way, discuss them with classmates, and then whiteboard to compare naming conventions. 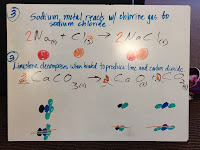 Then, we tried our hand at some formula writing, nomenclature, and particle diagrams for some ionic compounds, but we will not whiteboard and present these until next time. You can check out how the whiteboards looked in this session in the next entry--Day 11 recap. Also on Day 11, we will be discussing Gregg Swackhamer's Cognitive Resources for Teaching Energy. This is a must read for any science teacher who has to teach the energy concept or work with any kind of quantitative topics relating to energy. The main focus of today was quantifying energy transfer while keeping a strong connection between macroscopic observations of an associated change. In the modeling chemistry curriculum framework, the quantitative treatment of energy is an outstanding pedagogical approach that helps students critically think their way through specific heat and phase change situations instead of having them rely on mere equations and algorithms. Though equations can be used here as part of the problem-solving strategy, they need not be; instead, physical relationships between the quantities of mass, temperature change, specific heat, heat of vaporization/fusion, and energy are the focus and these are grounded in a graphical representation of energy storage and transfer. This approach is a further development of the qualitative treatment of energy that we introduced on day 6, inspired by cognitive resources for teaching the energy concept. The energy bar charts, a.k.a. 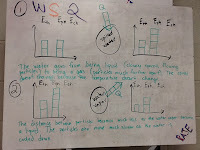 LOL diagrams, have been helpful for thinking about the energy transfers in systems, but today we related those transfers to several factors and attained a mathematical model for energy transfer during a temperature change, a melting/freezing phase change, and an evaporating/condensing phase change. 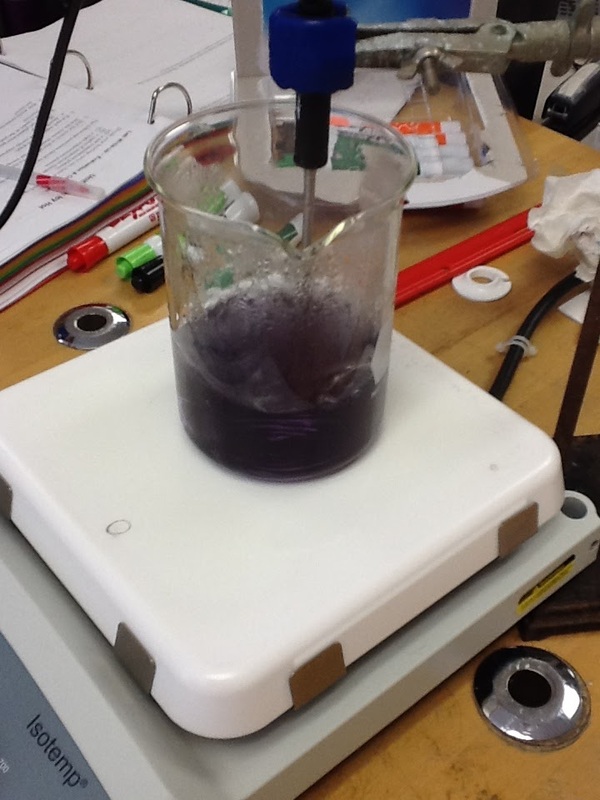 The models we used included specific heat and heat of vaporization & heat of fusion. Many of the participants noted that they "would not cover thermochemistry topics like this until well into the second semester," but expressed appreciation for being able to fit it in sequence with the development of our chemistry model so early in the curriculum year. We deployed our models on some practice problems and reasoned our way to solutions on whiteboards before presenting to the class. We kept our problem-solving approach in terms of our model and connected what we were doing to what we had seen in lab already. That meant utilizing a heating or cooling curve to represent what was happening in the problem as a basis for our problem-solving. Dealing with thermochemistry problems by connecting heating/cooling curves to energy bar graphs and to the equations, made it much more manageable to think through the problem and minimize errors. 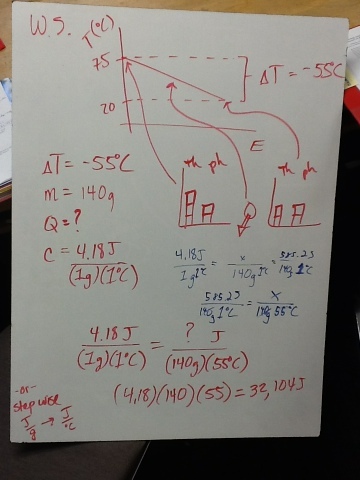 Take this example problem where an 140g of water cools from 75 degrees Celsius down to 25 degrees Celsius. 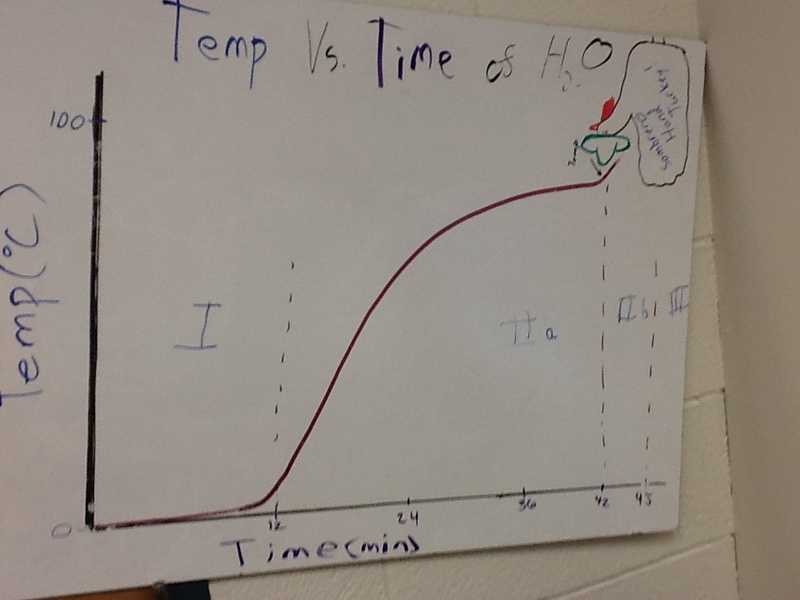 We solved this problem by first drawing a cooling curve to represent the situation, determining what type of energy transfer mechanism was at hand (temperature change or phase change) and then applying the correct relationship between the given quantities and the energy using the specific heat of water. 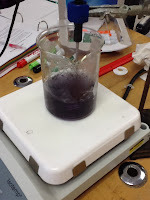 Other groups worked through problems that involved phase changes and the energy associated with that transfer, while other groups treated problems that had both a temperature change and a phase change. This allowed us to see how the heat of fusion/vaporization and specific heat could be dealt with in a modeling approach. We all agreed by the end that this would minimize the confusion of symbols and equations that some students encounter when trying to determine what to do to solve a complex problem of energy transfer in introductory thermochemistry units. We discussed several ideas for lab experiments in which students could determine or work with specific heat for water as well as the heat of fusion. Though we did not complete an experiment of this type in our session, many teachers had one in their arsenal to fall back upon in their classroom. Many are available online, and some require very low-tech setups. One take home message that came from all our experimentation, practice and discussion was that you can only measure energy transfers, not energy storage, and we should emphasize that with students. We started on unit 4, which deals with the physical properties of matter, and we launched into a discussion of such properties in tandem with a short movie on sulfur and iron in a mixture vs. a compound. 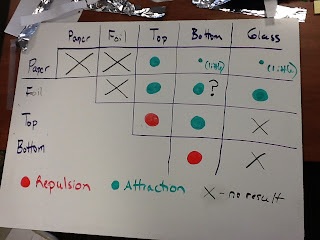 After listing the physical properties that we had as part of our model thus far, e.g., boiling point, melting, point density, heat capacity, and heat of fusion/vaporization, it was on to defining a mixture vs. a substance and then separating a mixture of several substances based on their physical properties. We introduced the new physical property of solubility and differentiated mixtures that were homogeneous from heterogeneous; we examined mixtures that were in both the solid and the liquid state. The exploration into physical properties introduced us to several separation techniques, including gravity filtration, distillation, and chromatography. This start of the fourth unit went on with formally defining and differentiating between a compound and a mixture, and then with constructing particle representations of each. Once we had assimilated compounds and mixtures into our model with the proper particle representations of each, it was on to begin quantifying this new component of our model using ratios. For example, in water, we know there are twice as many hydrogen particles compared to oxygen particles. (*Note: at this point the term "atom" has still not be formally added to the lexicon of our model.) We examined empirical evidence for the ratio of hydrogen to oxygen in water, building upon our model as it pertained to gases, with a Hoffman apparatus demonstration of electrolyzing water. 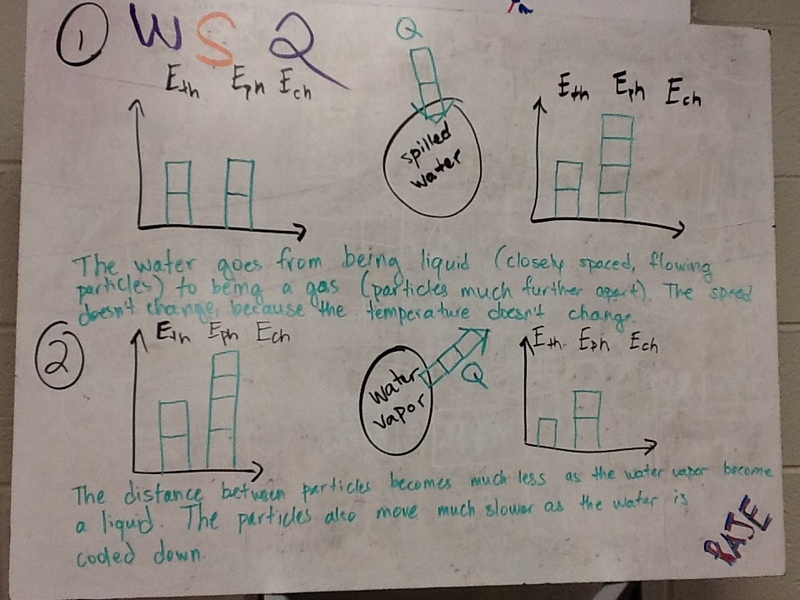 Abstracting from this new evidence for ratios and the aspects of our model that pertained to gases and observations from the electrolysis of water, we reasoned our way to Avogadro's hypothesis. There were numerous steps in the process of getting students to arrive at this as well as at the conclusion that there must be diatomic elemental gases, but to enumerate them here would not capture the essence of the modeling approach to developing this part of the model. However, by the end of the day, we had arrived at the law of definite proportions, and almost all of Dalton's atomic theory. Following the development through a historical perspective has given me an entirely new outlook on the history of chemistry, which is sometimes glossed over in a fact-based manner, and is influencing how I will teach chemistry in the future. For an online interactive way to experience some of what we went through in the workshop today, you can check out Dalton's Playhouse--or, you could always take a modeling chemistry workshop! The second week started off with just as much energy as the first. We started off with a hearty discussion of Testing for Conceptual Understanding in General Chemistry by Craig W. Bowen and Diane Bunce. This was perhaps our best article-based discussion thus far in the workshop. The article dealt with misconceptions in chemistry that have been elucidated by a number of researchers on the topic as well as assessment strategies to address misconceptions. When we "teach" something in class and then assess something similar, but only to find that the students weren't able to do it, we as educators conclude: "the students weren't able to do..." instead of "what did I the teacher do that led to this?" Do conceptual questions or explanatory open-ended and constructed response questions "hurt" students who have language issues? In the "real world," people have resources and life-lines, why don't we provide those parameters more in a classroom assessment setting? After this rich discussion, we moved on to a lab--the most EXCITING lab of the year--the water heating curve lab.We took some ice in a beaker and heated it through changes of state and temperature changes until it boiled. This lab took quite some time, but since we had so much fun doing it, we forgot about the time. Our exploration into energy transfers and storage moved from there to constructing a representation of the storage and transfer of energy using bar graphs, fondly referred to as "LOL" diagrams. These diagrams provide students a visual way to describe the energy stored in a system and transferred between a system and its surroundings. This handy and cognitive way of representing energy prevents energy from being vague to students and provides a way for them to think through situations and problems involving energy quantification and transfer. Once we had a way to represent energy, it was on to represent the energy storage and transfer in the heating of water experiment using bar charts. 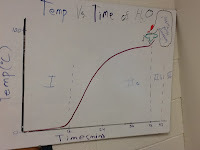 The LOL diagrams were connected to points on the heat curve and this allowed us to see what was happening with the energy, more transparently, during the different stages of the heating of water. For some background on the treatment of energy in the modeling approach, see Larry Dukerich's presentation on a coherent treatment of energy. After learning how to treat energy in different situations, we deployed our model for representing energy storage and transfer on the corresponding unit homework worksheets. Then, we whiteboarded and discussed some problems and their solutions. By the end, we had a pretty strong understanding of how to represent energy in a variety of settings. At the end of our first week of the chemistry modeling workshop, we have learned a ton about teaching, learning, chemistry content, and ourselves as educators. Though we didn't read an article for today to discuss, our session began with a very poignant discussion nonetheless. With regard to my Day 4 summary, our instructor noted that my recap of the day had conflated the mechanics of a thermometer, barometer, and manometer. Upon pointing out my error and talking through it briefly, I realized that what I had written did not, in fact, reflect what I thought but rather what I had observed in class. 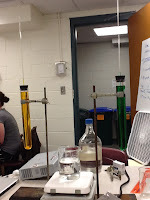 A demonstration of expansion was done with water and ethanol in test tubes the day before, where each was heated in a water bath and the liquid expanded up a glass tube. During class, we concluded that the liquid expanded due to a transfer of energy from heating, but we noticed that when the instructor sealed the stoppers on the test tubes (thus applying some pressure to the inside of the tube) the liquid also traveled up the glass tube. Mixing these two ideas together led to the confusion that a thermometer worked because of gas pressure and not thermal expansion. The discussion was very important, because it elucidated that our instructor even runs into the same conflation of ideas with her own high school students after doing this unit and was unable to identify the etiology of the misunderstanding. After seeing that we participants could fall victim to the same misunderstanding, and through a discussion of what happened that led to that misunderstanding, we identified that there was a sequence which may be at fault. We learned thermal expansion in liquids, equated that to thermometers, defined and discussed gas pressure, and moved right on to working with barometers and manometers in one continuous quick sequence. These measuring tools can all appear very similar at a superficial glance and without a dedicated treatment to their subtle differences, including the openness or closedness of the system, it is easy to mismatch how each works. We finished the discussion with a clarification of the way that each measuring device works and brainstormed ways to ensure that students leave this unit with the proper understanding of how each works. It's critically important that teachers be aware (and clairvoyant, if possible) of the misunderstandings and pitfalls that exist for students when learning certain ideas in the content. This is an element of what is known as pedagogical content knowledge, and sets mere content experts apart from master teachers of a content area. This was a prime example of an area that requires special attention to detail to ensure that students construct the correct model for how each, a thermometer, barometer, and manometer, works. We moved into a review of the relationships we learned through experimentation the day prior, between gas pressure, gas volume, gas temperature, and number of particles of a gas. We took our developed model of the relationships between these quantities and deployed it on some hypothetical problems on a homework worksheet. 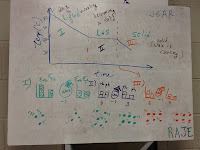 Each pair of students attended to one of the homework problems and whiteboarded their solution to present to the class. The catch to this whiteboarding session was that we were to participate in the "Mistake Game" as we constructed our whiteboards. This is where you intentionally embed a mistake into your board but present it as if it is correct. The other students in the class must try to decode the mistake you made. I personally like to call this game, "What's Up With That Whiteboard," after the popular SNL skit. All the participants did a great job feigning ignorance during the whiteboard session with their mistakes while others were quite the sleuths in elucidating the mistakes. Our whiteboard session, and pretty much the remainder of the day, consisted of two other major ideas: Socratic dialogue and a cognitive approach to solving P, V, T, & n problems (without formulas.) The former of these two ideas is essential to the modeling instructional methodology, while the latter is specific to the pedagogical content knowledge of chemistry. Socratic dialogue is a method of discourse-based instruction that has its roots in philosophy. It is attributed to Socrates, who is noted for teaching through dialogue with individuals in his time and area. Socrates' dialogues are famous works studied in universities and philosophy courses around the world. Modern day Socratic dialogue, or Socratic discourse, can be applied in any content area by any teacher, but serves a main role in the discourse of modeling instructors' classrooms. To get a sense of Socratic dialogue in a philosophical sense, you can check out this inquiry into the nature of authenticity. Every participant in a modeling workshop needs to be keen at crafting questions that are differentiated enough to target specific misunderstandings at a variety of different levels in the scheme of a learning progression for every student in a way that appeals to their their experiences as well. Our instructor is masterful at Socratic dialogue and questioning technique. She has demonstrated some top-rate approaches to questioning and dialogue; in week 2, the participants will be on the hot seat to practice their question and play the role of teacher with the rest of the participants during a whiteboarding session. Many have expressed concern with their ability to execute a successful Socratic dialogue in the modeling methodology in their own classroom, but it is really a matter of practice and it comes naturally with time to everyone who attempts it. A 475 cm3 sample of gas at standard temperature and pressure is allowed to expand until it occupies a volume of 600 cm3. What temperature would be needed to return the gas to standard pressure? Draw particle diagrams to represent the situation and solve. The table is difficult to describe in words, but I will say that IFE stands for "initial, final, effect" and requires students to consider the initial and final conditions, which is common with the formula-based approach, but also the fraction by which each quantity changes. This step differs from other equation-based methods to solving gas law problems, because the students focus on the relationships and the fact that the proportional effect must be the same for each quantity. Like I said, because it is not an algorithm, it is challenging to merely "name the steps" of this strategy as it is with conventional algorithms; however, I will say that one cannot use this method to solve problems without having to think through the problem and really understand the relationships between the variables. It was a very different approach to solving gas law problems and I really found value in it because of its cognitive approach to proportional reasoning. My own personal philosophy on problem-solving strategies is anti-algorithm and pro-cognitive whenever possible, so this method will find a welcoming home in my classroom! The conclusion of the whiteboarding session ended unit two for us, but the day did not end without a short introductory discussion of unit three: "an honest conversation about energy." Unit three will examine energy storage and transfer more quantitatively, but its approach to handling energy, like most other things in modeling instruction, is heavily influenced by cognitive science. The major contributions of Greg Swackhamer, with his article on a cognitive approach to teaching energy, are a driving force behind the treatment of energy in physics and chemistry modeling instruction. We are reading the entire article by Swackhamer to discuss next week. Overall, the first week was tremendous and such a positive experience. The next two weeks hold many more things for us to learn, but if these first days are any indication, the remaining days will also be awesome! What is energy and how would you explain it to someone?